“What is the current state of the Occupy movement?” If you go down to the Civic Center or your local City Hall, are people still living there? 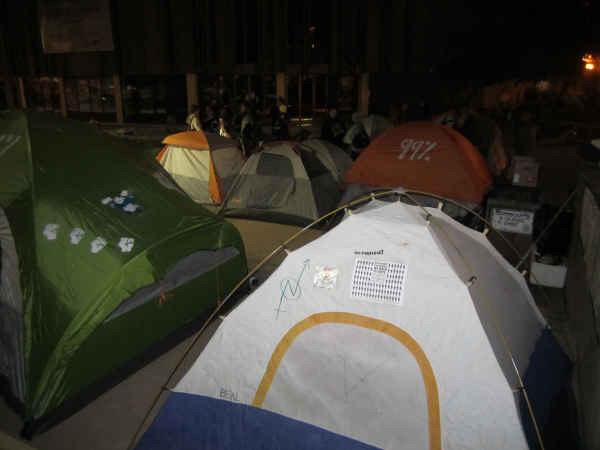 The Occupy movement, including Occupy San Diego (OSD), is still alive and well, but no, there are not people still living there – well not people flying the Occupy flag anyways. 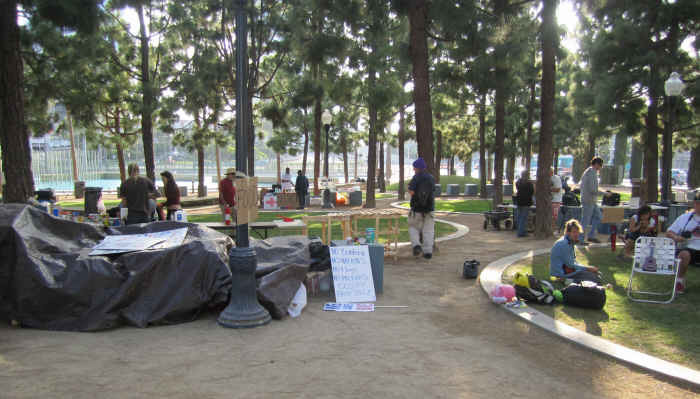 Although some argue losing the encampments was good for the movement and has freed up time for other things, otherwise Occupy would still be busy discussing solutions to problems like feeding each other, trash collection and dump, or how to deal with the homeless and mentally ill population, it was not by choice that the Occupy encampments were broken up. Looking back we remember that it seemed like a national coordinated effort to crack down on the Occupy movement that ended the physical encampments, which was later confirmed by a response from a Freedom of Information act demand filed by the Partnership for Civil Justice Fund . Instead of occupying public spaces, the movement is now occupying people’s lives. As activists went home and took showers, got jobs, tried to get jobs, returned to their old jobs, or simply returned to their communities, they also got organized and focused. Some stayed close to Occupy, continuing to attend OSD General Assembly meetings where the meat of Occupy business takes place, while others branched out into new committees or groups to handle local issues. 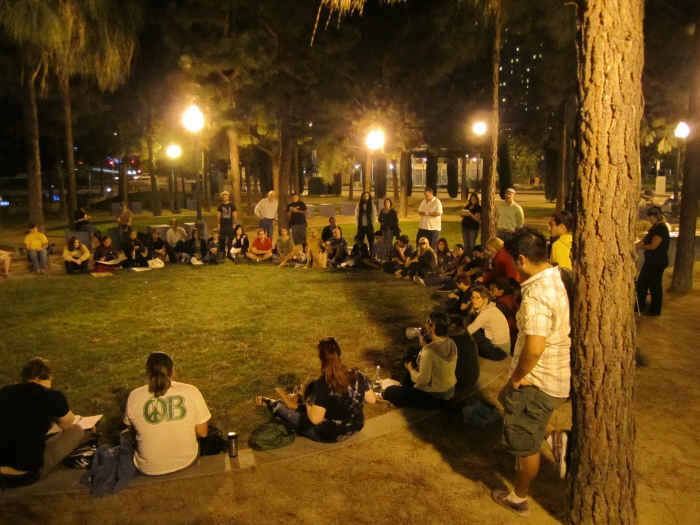 If Occupy did anything, it connected like-minded activists and individuals, and put people in contact with each other who are willing to stand in solidarity with each other and work together on their separate issues that they now realize, possibly thanks to OSD, are inter-connected. 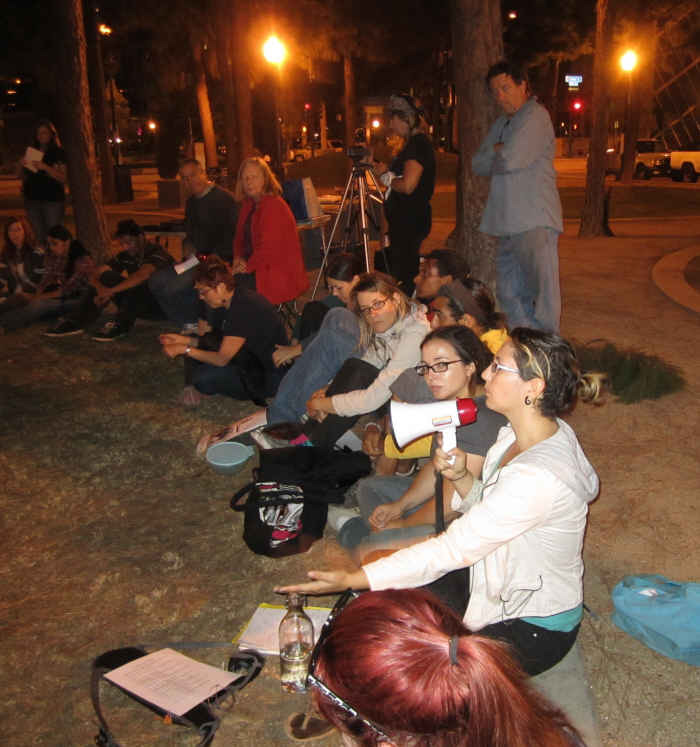 Occupy San Diego General Assembly meetings, or GA, began September 27th of last year and were daily in preparation for, and after, the physical occupation that began October 7. 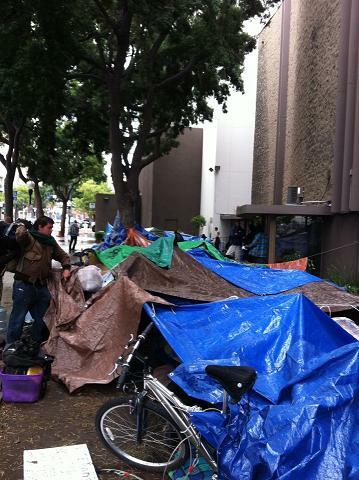 Even after the physical encampments ended OSD continued having daily GA’s well into February of 2012. GA’s still take place to this day, although they have been shaved down from daily to twice or once a week, depending on who you talk to. The issue has become a bit of controversy among OSD members. In February a proposal went through GA to hold a vote of ‘no confidence’ on a man because his behavior was found to be inappropriate by some in OSD. After running through GA for over a week the proposal still had not passed. The issue came to a head February 8th, the same night OSD had taken to the Gaslamp street corners to commemorate 100 years since the San Diego Free Speech Fight of 1912. Many people that had been voting for the vote of no confidence proposal and really wanting it to pass, left GA that night immediately following another failed vote on the proposal, vowing not to return to the Civic Center, saying they could not work with the man they were addressing in the proposal. Shortly there-after the people who left that night began having GA’s at Children’s Park while others kept meeting at the Civic Center . Some say there was as a walk-out and split of OSD that night, while others say calling it a split is wrong and there was no walk out. Some say even categorizing what happened that night as having two sides is wrong. Some say what ever happened that night is not important and we need to move forward, while still others say the walk-out showed disrespect for democracy itself and needs to be addressed. Again, it has become a bit of controversy among OSD members. To this day there are still two different groups that meet for OSD GA. One group meets once a week Saturdays at 2pm at the Civic Center , and one group meets twice a week Wednesdays at 7pm at Children’s Park and Saturdays at 2pm at Balboa Park at 6th and Laurel . The Civic Center group does not currently have an online presence, while the Children’s Park group is maintaining a site with a calendar of events here. No matter where they meet, the OSD GA has been very active this year as they continue to fight for social and economic justice. The most recent success was a week long Stop TPP action July 2 – July 7 that was focused on stopping the Trans Pacific Partnership agreement, as negotiators from all over the world were in San Diego that week having Round 13 negotiation talks at the San Diego Bayfront Hilton. The action included a week long People’s Conference highlighting and educating the effects the TPP agreement will have on local communities here in San Diego , across the United States and across the world. At the end of the week OSD had a pots and pan march starting at the Civic Center and ending with a rally in front of the Hilton Hotel. On the radar for the near future, OSD GA has endorsed a No Genetically Modified Food/ No Monsanto day of action September 17 at 5pm organized by Woman Occupy San Diego, and a Stop Walmart march on Saturday Sept 22 organized by the local Sherman Heights community. OSD is also getting ready to celebrate the one year anniversary of Occupy Wall Street on Sept. 17 and the one year anniversary of OSD on Oct. 7, but have not yet finalized the plans for those days. Although no complete list of arrests from OSD was kept and maintained, Occupy Arrest did a good job of capturing most of them. 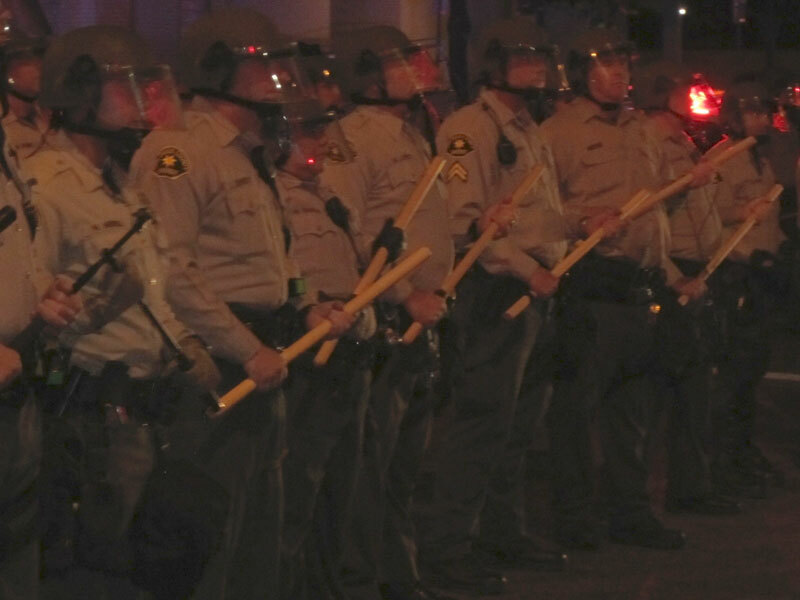 Of the 7,400 arrests nationally Occupy Arrest has gathered, Occupy San Diego can lay claim to at least 98 of them. Most of the charges were actually not filed on these arrests, though select handfuls were. Three occupiers actually went to trial over occupy charges, with only one occupier, Curtis “Hex” Williams being found not guilty during a trial case. Andrew Fisher was actually sentenced to 6 months in jail for obstructing an officer while filming an arrest, but ended up spending 3 months in jail. Bobbi Uribe was also found guilty in court for jay walking and resisting arrest and received probation orders . Through out the year other community groups aside from OSD have been born out of the Occupy movement. Occupy Walks USA, Woman Occupy San Diego, Occupy City Heights, Committee Against Police Brutality and Reclaim San Diego are all active groups inspired by OSD. Occupy Walk USA will always be anchored to OSD as they began their journey from the Civic Center Feb.18 to walk across the United Sates from San Diego to New York. The group of 5-8 men and woman successfully walked from San Diego to Santa Fe , New Mexico, and while they fully intend on finishing the walk, they got a little side tracked. The group attended the Occupy National Gathering in Philadelphia , and the NATO protests in Chicago. The walk is still on hold while they try to regroup in Santa Fe. With one occupy walker on house arrest in Chicago, and the one year anniversaries quickly approaching, it is hard to tell when they will regroup and continue the walk. 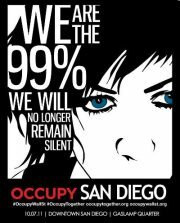 Woman Occupy San Diego meets monthly and focuses on woman’s issues affected by the imbalance of the 99% and the 1%. WOSD has a singing group called the Occupellas who raise awareness of occupy issues using song. The Occupellas just performed at the Woman’s Suffrage Rally at Balboa Park this past Thursday August 30th, raising attention to the anniversary of woman having the right to vote. In the near future WOSD is focused on a national No GMO Food/ No Monsanto day of action on Sept. 17 and have planned an action at 5pm that day.. Occupy City Heights is a local community occupy group focusing on the issues and solutions to problems relative to City Heights, a diverse community in the Eastern part of San Diego. OCH meets weekly Saturdays at 12pm at the City Heights Performing Annex according to their Facebook page. To get involved with OCH show up at a meeting or emailing their Google group here. The Committee Against Police Brutality “is a group of grass-roots people who have come together democratically to serve the needs of the community.” CAPB is “made up of a cross section of the community and call for the support and participation of all people who are affected directly or indirectly by police brutality, harassment, and misconduct,” according to CAPB’s Facebook group page. The group meets weekly on Saturdays at 12:30 pm at the City Heights Performing Annex. CAPB has recently helped organize marches and rallies for the family of San Diego Police Department victim Victor Ortega. Ortega was killed by Officer McCarthy and the family is still waiting for answers regarding the evaluation of the officer’s use of lethal force, which apparently is currently being reviewed by the District Attorney’s office, while Officer McCarthy has returned to duty. CAPB’s next rally for Ortega and his family is Saturday Sept. 7 at 5pm at the San Diego County Hall of Justice. CAPB is also working on creating a Cop Watch group to patrol the officer’s of SDPD, reaching out to the high school community to out reach about curfew patrols, and hosting a Know Your Rights Movie Screening and Workshop later in the month Sunday Sept. 30 at 5pm. Reclaim San Diego is a newer group currently being formed that is focused on creating solutions at the community level for the problems being faced. One thing Reclaim SD is already doing is keeping track of all the community gardens in the San Diego area here, where you can also see other projects Reclaim San Diego is supporting. As the Occupy movement rounds the base to it’s first birthday, rather than seeing activists huddled in circles at their City Hall and Park encampments having meetings bundled up in jackets and scarves to ward of the cold, as we did in the beginning of the Occupy movement last year, in this OWS history film by Faultlines we see Occupy activists back in the comforts of their own homes, discussing the early events of the Occupy movement. Across the United States and here in San Diego we are seeing Occupy activists who used to spend every day at the physical encampments find balance between the time they spend at Occupy and the time they spend enjoying their personal lives. We are seeing Occupy activists branch out, focusing their attention away from living together in a public space and on to organizing committees and groups that take real action to solve real problems in the local communities. 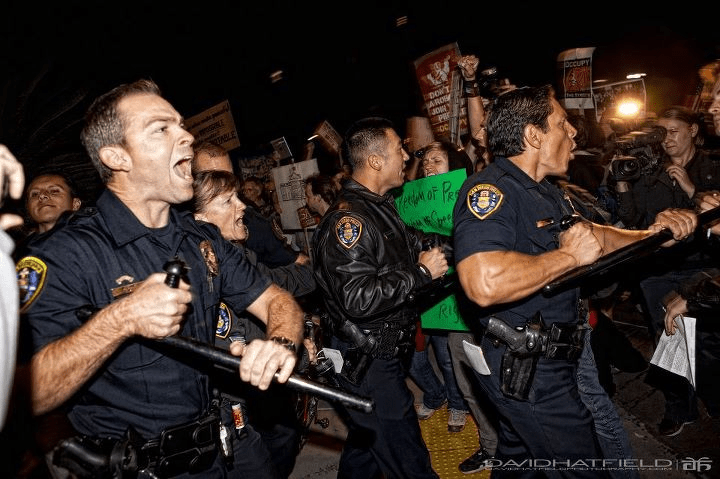 Kali Kat is the nom de plume of a media activist who was submerged in the Occupy San Diego movement and whose name became synonymous with raw and poignant coverage of the movement from the stand point of being on “the inside”. Kali, this is a wonderful and realistic account of OSD over the past several months. Looking back, I only wish I’d been there for that first march on October 7th! I’ve heard SO much about it. The Occupy movement and Occupy San Diego movements are historically significant, and changed some lives forever. Kudos for you to be there right from the get go and helping to get OSD off the ground! Once awakened there’s no sense going back to the MSM-induced quasi-reality/sleep, for many OSDers. I hope that this article helps people realize that OSD and the other groups you mentioned are still around, and still are a force for positive change on our planet! So True, David. The cool thing about the evolution is that we have branched out into so many efforts from right in the neighborhoods where we live to the welfare of the hundreds of millions of people who will be adversely affected if we don’t stop TPP! Not always an easy road, we learned as empowering as horizontal democracy can be, it can prove very difficult on occasion. That was kind of a necessary lesson to learn, and we at OSD still struggle with it at times. Very informative and inspiring article, definitely a moodlifter for this prodigal OBcean now living up in the volcanic heartland of northern California. I’d love to see this kind of summary of where Occupy has taken people in every town. In Redding, the closest city to where I live, Occupy Redding is not as visible as it once was, but still meeting and planning. At least some of them are involved in tomorrow’s Shasta Gay Pride celebration, set to be by far the largest yet around here. Anyway thanks for the info and the lift. Occupy Your Corner does quite a bit and deserves mention. Josephine – please give us some info and perhaps a link or two. Thanks for this history. I’m a member of Occupy OC, your neighbor to the north. We’ve seen some similar issues with a person or two threatening to derail everything and the GAs not quite able to handle it, but we’re still here also, preparing for our Oct 14 anniversary at Irvine Civic Center. Great article! So inspiring for us to continue building community through positive actions, as the weeds and shrubs were cleaned-up by a bunch of us yesterday at the new OB entryway, and so many folks passing by and stopping to share some time with us. So, thanks to all who allow their own Occupy movement to live and flourish within each community, where the true movement begins and ends: With the community. Re: the vote of no confidence, the vote of no confidence against the man did win and was (almost) unanimous for all, like 45 people who attended and voted, i recall.